Vermiculture is the science of worm composting. Worms can eat their body weight each day in fruit and vegetable scraps, leaving castings as the byproduct. Worm castings are called worm compost. 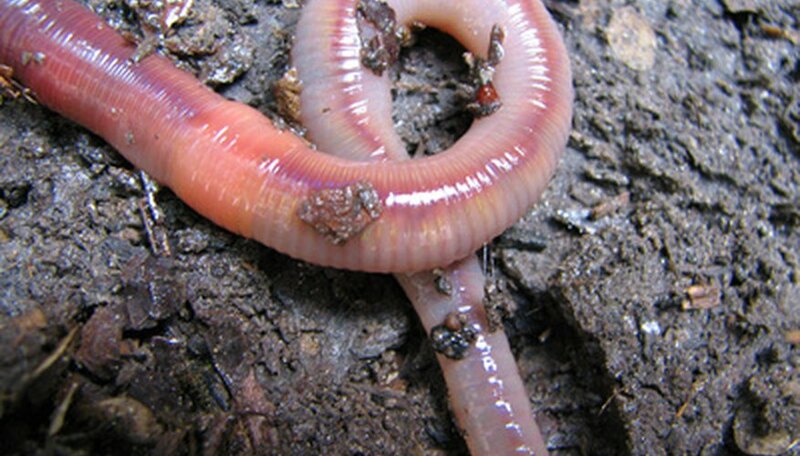 Redworms, also known as red wigglers, are used for vermiculture. Worm compost contains “5 times as much nitrogen and 7 times as much phosphorus as is typically found in topsoil,” according to Jeff Spurrier of the "Los Angeles Times." It takes two months to harvest a batch of worm compost. One popular method for vermiculture is a two-tiered, stackable bin that is 16 by 23 inches in diameter and 19 inches in height. It can be purchased at many public composting workshops (see Resources). It has trays for worm composting and one tray that catches the liquid runoff, called worm compost tea. It has an airtight lid and vents on the sides, and it sits on four legs for easy access. A spigot releases the compost tea when needed. Bedding material for the worm population can be shredded newspaper or a coconut fiber product called coir. A layer of moistened bedding material is spread on one tray and then ½ pound of redworms is added. A small amount of food, such as banana peels, coffee grounds and filters, fruit and vegetable scraps, gets them started on the process of creating compost and compost tea. Sixty to 80 degrees Fahrenheit is optimal for the worms' well-being. Castings are the byproduct that becomes nitrogen-rich compost for the garden. Vermicompost bins are easily made at home from two plastic storage bins that have tight-fitting lids. Holes are drilled in the bottom and around the perimeter near the lid; worms need good ventilation. A worm composter does not have an odor when the “recipe” is balanced between food, bedding materials and worm population. Odors occur when the bedding materials are too compacted, when there is too much food in the bin or the bedding is too wet. Moisten the coconut coir or newspaper bedding, add worms and a small amount of food. Prepare a second plastic storage bin with the same drilled holes and place it underneath the first bin. This one catches the “worm tea” runoff. Redworms can be caught in your garden by putting out a wet piece of cardboard overnight. Commercial worm suppliers may be found through local compost programs. The National Sustainable Agriculture Information Service describes large-scale vermiculture as important to sustainable farming. “To design a sustainable agricultural sector, the outputs from each production enterprise must become inputs to other enterprises just as in nature. Everything in the natural system is food to something else.” In large-scale farm vermicompost operations, the compost is returned to the land or sold to compost companies. The worms themselves are also marketed. Worm tea sells for $25 a gallon. Popular methods of large-scale vermiculture are batch reactors, continuous reactor process and the windrow method. The windrow method involves putting waste products into wide beds and adding bedding materials and redworms. The bedding and waste are continuously replenished. Harvest is done by allowing the worms to crawl into a new bed and removing the compost from the original bed.